To take down hazardous drones, police in the Netherlands have turned to the ancient art of falconry. Guard From Above, a Dutch company specialized in training raptors — the birds of prey, not what Chris Pratt works with in Jurassic World — has teamed up with the national police to teach eagles to neutralize rogue, unmanned aircraft. 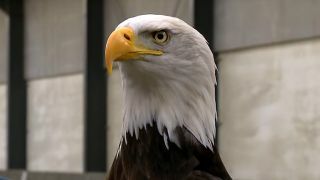 Not only are eagles naturally capable of pouncing prey at high speeds and carrying a considerable weight with their talons, but the creatures used in the program are also trained to safely relocate a captured drone to a safe distance. The Dutch police are also testing out safety nets, a more conventional — albeit less awesome — method for intercepting drones, but say that a conditioned eagle provides better control over where the downed aircraft ends up. In a press statement, Dutch Police innovation manager Mark Wiebe mentions examples in which shooting down a drone could present a hazard for people below, such as a public event or a medical emergency involving response vehicles. While the program thus far has been successful, a police spokesman says the next step in the trials will require finding better ways to protect the eagles' talons from a drone's rotors. We imagine the end result of the program to look something like this. Raptors not your jam? Try using web shooters to take down drones!